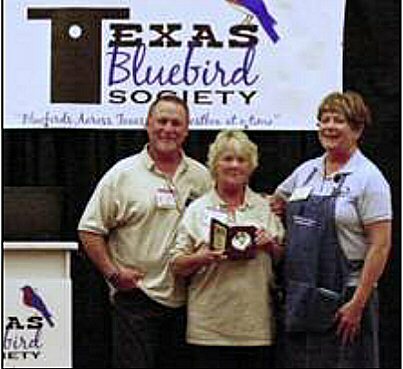 The Blue Feather Award is a service award given by Texas Bluebird Society in appreciation for exemplary service benefiting TBS. Nominations for the award come from the Board of Directors and are submitted to previous recipients who act as the nominating committee. It's our group's significakudo to an individual who has made extraordinary efforts to promote the conservation of bluebirds, which makes them a "true blue" bluebird friend. 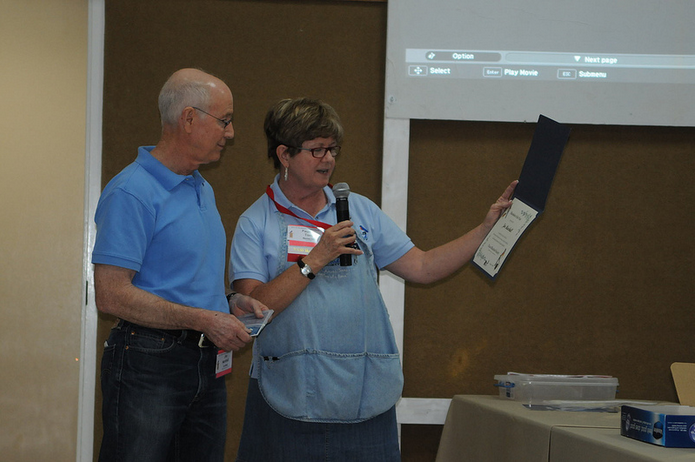 Lonnie Castleman's service, with heart and soul, to and through Texas Bluebird Society was woven into the fiber of the organization, from the time he joined us. Lonnie loves people and bluebirds and Texas Bluebird Society. His passion comes through day and night in appointments made through his Distributor listing on the website or his magnetic TBS sign on his vehicle and in his scheduled bluebird presentations. Time and time again he has brought in new recruits through happenstance conversations, always getting them started with NestWatch. With a smile on his face, Lonnie has logged thousands of miles and hours delivering nestboxes, meeting and coordinating the work of our certified nestbox builders, working the TBS booth at festivals, inspecting event venues, giving presentations, installing nestboxes, inventorying event supplies, attending (via GoToMeeting) and preparing for board meetings, attending event planning meetings and official Power-Point presentation update meetings, affixing stickers, answering emailed questions, and much more. Lonnie Castleman clearly rose to the top as the sole nominee for the 2017 Blue Feather Award. In the half year between 2015 Symposium and 2016 Kickoff, Keith and Selena Schindler shouldered heavy weights for Texas Bluebird Society, filling critical gaps. 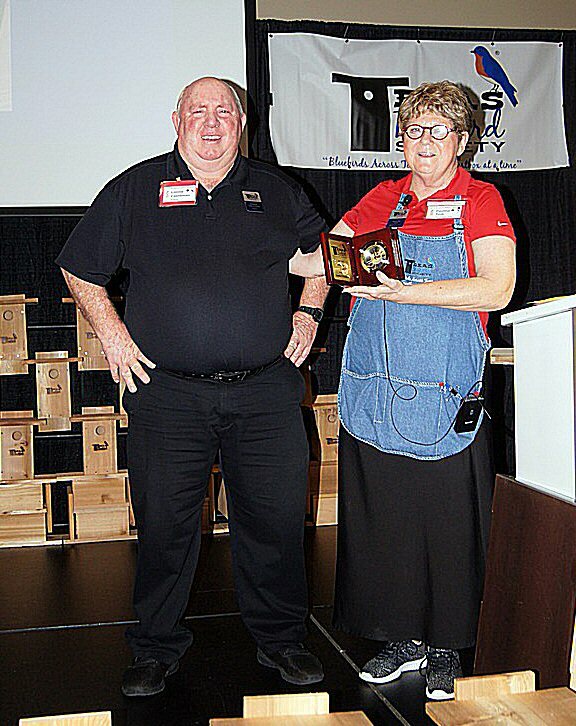 Most notably, when our Auction Inventory Coordinator, Beverly Davis, had an emergency that necessitated her leaving in the middle of planning the 2016 Season Kickoff, the Schindlers willingly stepped up to become Auction Inventory Coordinators for the Kickoff that year. Because of their committment to this major role the schedule proceeded as planned. They received and logged each shipped donation and made a trip to Conroe to pick up the donations Beverly already had on hand. Keith even added photos of auction items to the website for the 2016 event. In addition, for months we had been without an Assistant Webmaster and Web Editor, a job for which we paid an hourly stipend. Keith created the Kickoff event webpage, then volunteered to take the Assistant Webmaster/Web Editor position, which necessitated a lot of "catch up" training with our Webmaster, Clyde Camp. Keith takes photographs of our events; and he and Selena have faithfully donated auction items and served as silent auction volunteers through the years. As a matter of fact, we had to take Keith's camera away from him and drag Selena away from the auction tables so we could present this award to them and get their picture taken. They are very much appreciated. Ken is recognized for his countless hours of extraordinary service as Treasurer with superb and gracious team support. Don devoted countless hours to the start-up of our efficient nestbox production process that allows large-scale nestbox construction and distribution. Throughout his service as a Board Member, he has assisted (always with a smiling face and encouraging words) with the numerous tasks involved to create successful Kickoff and Summer Symposium events. In addition to maintaining his own bluebird habitat, Don is happy to provide new online members with our member packet and nestbox coupon. 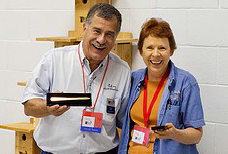 Don is now our product quality control advisor for nestbox builders and participates in the competency program to authorize production. Like the duck that floats peacefully across the water, Benni is the one that's paddling like mad to make it look easy. Benni and her husband Jimmie are among the charter members who are still active in Texas Bluebird Society. 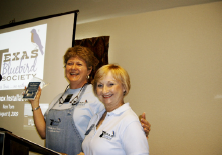 Starting with the 2010 Summer Symposium in Henderson, Benni took on responsibilities for organizing and coordinating the silent auctions. These auctions have brought in nearly $14,000 for lumber to build our nestboxes! Some of the auction tasks that Benni does are: Plan the layout of the tables for regular silent auction and the extended auction; organize the volunteers that work before, during and after the auction; find many items that Benni & Jimmie personally donate to the auction; watche the clock to end the auctions; and direct volunteers on the close out processes for both the regular and extended auctions. Benni is also a key member of multiple TBS teams including the WebTeam, Newsletter Team, and EventPlans team, a regular contributor to the Texas Blues Newsletter, and a full time English Professor at Tarleton State University. Coordinates TBS "True Blue Friend" nestbox dedication program. Judy accepts orders for custom nestbox dedication plaque and places each order with our vendor; she then proofreads nestbox dedication before mailing. Her work is tireless. Her energy is boundless. Judy serves selflessly with dedication, innovation, inspiration, coupled with a generous spirit and a wicked sense of humor. 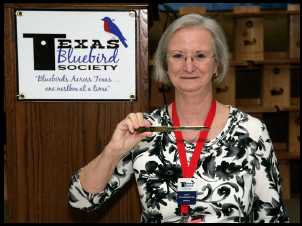 The prestigious Blue Feather award was presented to Ron Tom, acknowledging his dedication and virtually non-stop service for TBS during the 10 years of Texas Bluebird Society's start-up and growth. Ron Tom has performed intense behind-the-scenes work and made immense personal sacrifices. His wife, Pauline, gets the spotlight, but it is a team effort. In early years, he folded newsletters (to save cents) and licked postage stamps, sometimes late in the night or delaying departure on a trip, so that "Texas Blues" would go out on schedule. Ron faithfully makes trips to TBS' P O Box in Austin. Arriving home from business trips, he detours by the post office rather than making a straight drive home. At events, he's the "go-fer" and Pauline's "Vanna". Ron is always there to provide manual labor, encouraging words, and pickup driving duties. When TBS has a festival booth, Ron travels "across Texas" to serve all day, from set-up to take-down. 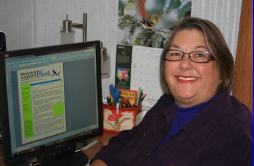 Debbie exhibits a great passion with respect toward the conservation of bluebirds. TBS especially appreciates Debbie's organization and dissemination of information regarding bluebirds and their habitats. Because of Debbie's efforts, hundreds of members received newsletters, emails and information packets. Debbie's commitment to TBS includes spending hours at her computer analyzing monthly membership data for the President's Report, preparing renewal notices and information packets, and working on the newsletter, TEXAS BLUES. Debbie also participates in our public speaking engagements regarding our beautiful bluebirds. She is an avid supporter of all of our events, driving miles to lend a hand in setups, en-rolling new members, takedowns, and loading and delivering nestboxes to events. She is very instrumental in the organization of our annual symposiums and our "Kick-Off‟ events. Always searching for ways to improve the operation and adminis-trative aspect of TBS, she is responsible for improvements in all areas of TBS. All of her diligence and hard work has really paid off for the Texas bluebirds we all love. Thank you Debbie for an excellent job and outstanding service to TBS! "For extraordinary volunteer service - ambassador, booth coordinator, nestbox monitor, philanthropist, and devoted bluebird enthusiast. Always ready and willing to help in the spread of Bluebirds Across Texas … one nestbox at a time." Barb also helped a concerned citizen relocate nestboxes located in the "line of fire" on a disc golf course. While relocating the nestboxes, the President of the Disc Golfers Club offered to donate $100 to TBS! Barb's enthusiasm and dedication are appreciated. Who could ask for more? Thanks Barb! 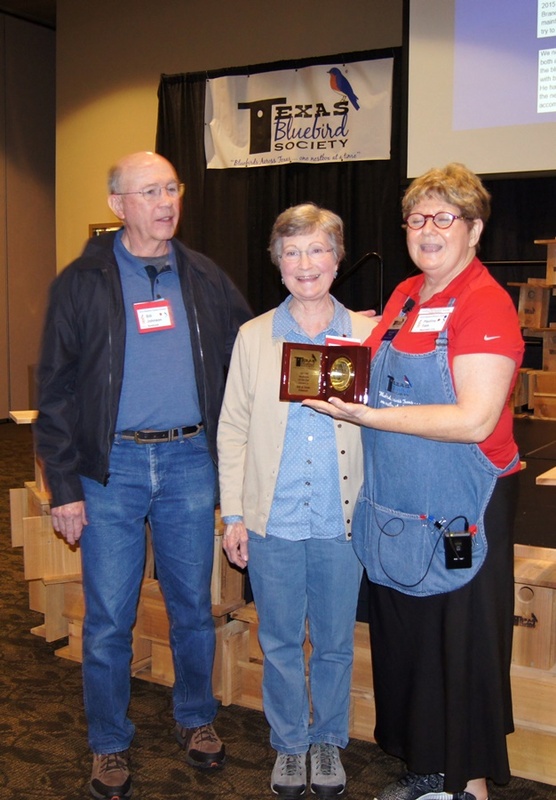 Birder, Master Naturalist, Master Gardener, Quilter, wife, mother – Linda has held a special place in her heart for bluebirds since 2000 when her beloved cat passed away. "I was so sad. A pair of bluebirds began coming to my yard and gave me such pleasure that I felt God had sent them to cheer me up! I joined TBS in 2005 and have enjoyed watching the nesting and fledging activity ever since. I feed my bluebird friends mealworms. I whistle every time I put the mealworms in the feeder. What fun to watch the parents and kids fly in to feed on cue!" Linda admits she even names her bluebird friends. Linda is a certified Master Gardner and averages about 300 volunteer hours a year at the Montgomery County Extension Office in the Floral Gardens section. Linda has made a variety of contributions to TBS. First and foremost, her talent as a speaker has put her at the top of the list for various organizations requesting bluebird presentations. Linda customized the Texas Bluebird Society's educational slide presentation with her own photographs; some of the pictures are from her own backyard! 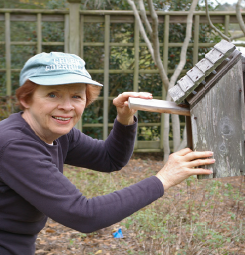 This presentation, along with her bluebird knowledge and enthusiasm, encouraged scores of participants to join TBS and install nestboxes in their own backyards. 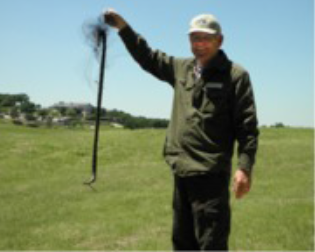 Linda has made presentations to the Montgomery County Master Gardeners, Texas Master Naturalists (through the Lonestar College ALL Program), Fifth and Sixth grade students at Wilkerson Intermediate School, and Arbor Gate Nursery. 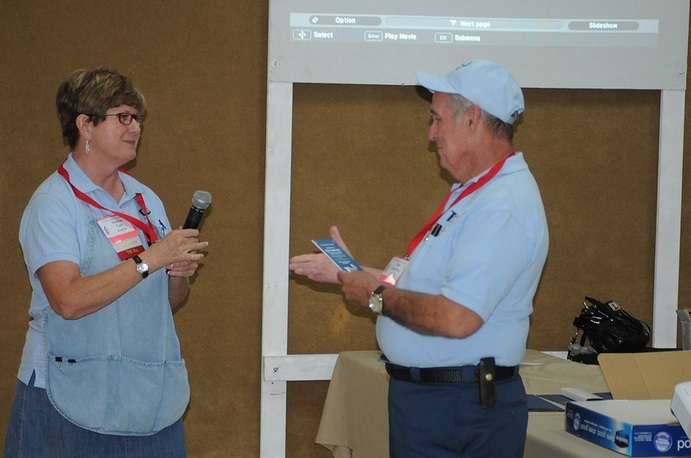 Linda's volunteer skills were put to the test when she became the 2008 Summer Symposium Coordinator. Along with the help of a few other volunteers, Linda coordinated every aspect of this highly successful event from start to finish. The Symposium, a daylong program about bluebirds, attracted 34 participants to the sessions held in The Woodlands. As well as running the show, Linda found the time to speak on a subject she is very concerned about, "How to Deal with House Sparrows" (click here for more information about House Sparrows and bluebirds). Thanks for all the wonderful volunteer chores you have accomplished for TBS. There is no one who deserves the Blue Feather Award more than you! They are active in keeping bluebirds safe. During winter maintenance, they paint weathered nestboxes a light color to keep the nestbox interior from reaching temperatures that far exceed the ambient temperature. And, they add predator guards. They are ambassadors. They talk with people they meet while they monitor the nestboxes, sharing the joy of bluebirds. They are citizen scientists. They report to NestWatch their observations, making a difference beyond Benbrook and into perpetuity as the records are housed at Cornell Lab of Ornithology. We're proud to recognize them as "Bluebirder of the Year". Donna is recognized for her efforts in spearheading the Tierra Verde Nestbox Trail (Arlington) with heavy emphasis on NestWatch'ing. Congratulations Donna! Anyone who read David Pruitt Receives Prestigious Hornaday Award in our March 2014 newsletter recognizes David's contributions to the bluebirding world. How encouraging to know the younger generation is not only aware, but willing to work towards, conservation of nature and our environment. Definitive proof of David's dedication is evident through his demanding Eagle Scout badge accomplishments, and as recipient of the Boy Scouts' very prestigious Hornaday Award. David isn't content to limit his enthusiasm for nature conservation to himself. 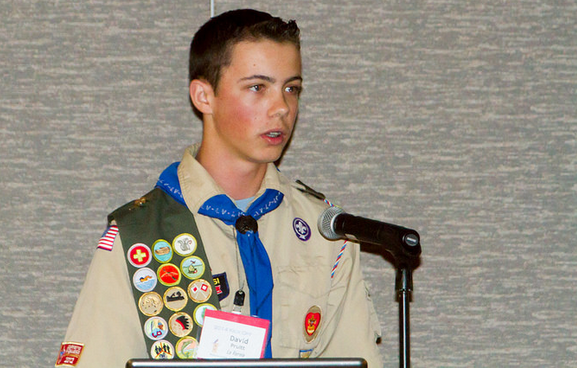 He finds great joy in involving his fellow Eagle Scouts to join him in his many endeavors. Over the last three years David has been building nestboxes, establishing nestbox trails, monitoring these trails, and faithfully recording observations on NestWatch. Culminating in a twenty-two nestbox trail at Mitchell Lake Audubon Center, David also instructs adults and other scouts on proper trail and monitoring procedures ensuring "his" trail will continue to be NestWatched when he departs for college and other adventures. TBS is extremely proud to recognize David's achievements. Best wishes in all of your future endeavors! Mike shows the heartbeat and soul of the Texas Bluebird Society. He demonstrates major elements of our mission statement ("Bluebirds Across Texas ... one nestbox at a time") through education, the installation of nestboxes in appropriate habitat, and sustaining and increasing the bluebirds' natural food supply-all while enjoying the process and the birds. Jim Marshall's story of providing nesting space for bluebirds in Fort Worth began in 2007 when he saw a bluebird while bicycling on Trinity Trails. It occurred to Jim that he had never seen a bluebird in the city, and he realized the opportunity to help the bluebirds by installing nestboxes. He took the initiative to work through Streams and Valleys (a non-profit) to obtain permission from the Tarrant Regional Water District to install nestboxes along Trinity Trails, starting just a block from a busy urban shopping corridor. Jim started with one nestbox and added over 30 more with the help of "Project Bluebird" volunteers. Now, "Project Bluebird" volunteers have installed 7 nestboxes at the Fort Worth Botanical Gar dens and helped the Colonial Country Club install 14 of its own. 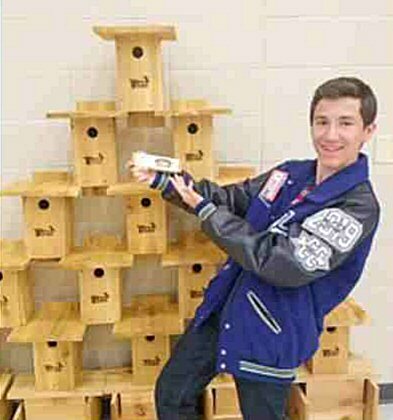 All around the Fort Worth area, Jim has installed or helped others install 70+ nestboxes. He also recruits volunteers to "NestWatch" Project Bluebird's nestboxes weekly, while Roberta Marshall (Jim's sister) enters the observations into Nest-Watch.org All this and more occurred because Jim Marshall envisioned the possibility and started with one nestbox. His vision and efforts have increased the pop-ulation of Eastern Bluebirds in Fort Worth and, provided joy to humans who have become involved with bluebird conser-vation and those who glimpse the "bluebird of happiness." Luke was award the Bluebirder of the Year Award for his significant conservation efforts and bluebird presentations to the community. At age 18, Luke has been watching bluebirds for five years and speaks to groups all over Texas about getting involved with conservation efforts. Luke's engaging manner and funny stories, not to mention his impressive expertise, made him a very popular addition to our 2011 Summer Symposium. "I have enjoyed bluebirds since 1986 when I built my first nestboxes. As a woodworking hobby I built 3 boxes and placed them along the I-30 service road near Winfield. A week later I was amazed to find four pale blue eggs nestled in a neat grass cup. Needless to say I have been hooked on bluebirds ever since. I have monitored up to 75 boxes, but as more local people have put up boxes I have been able to downsize to a more manageable 50 boxes. Bluebird conservation has been a very enjoyable and rewarding way of life for me." Texas Bluebird Society proudly honors the work you have accomplished and join our bluebird friends in hearaelt appreciation. THANKS! 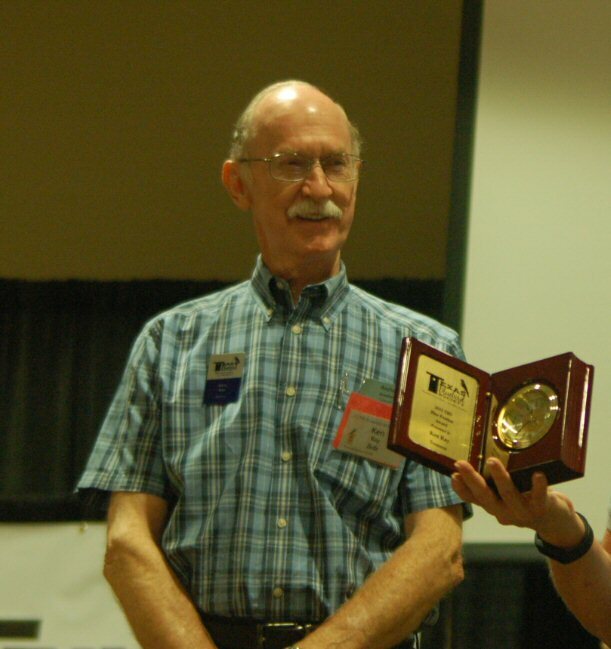 Much to the surprise of Keith Kridler, his "introduction" as the Speaker for the Day at the Gulf Coast Bluebird Symposium in Beaumont on August 9th was actually the presentation of the "Cornerstone Award", an award specially created to honor Keith. 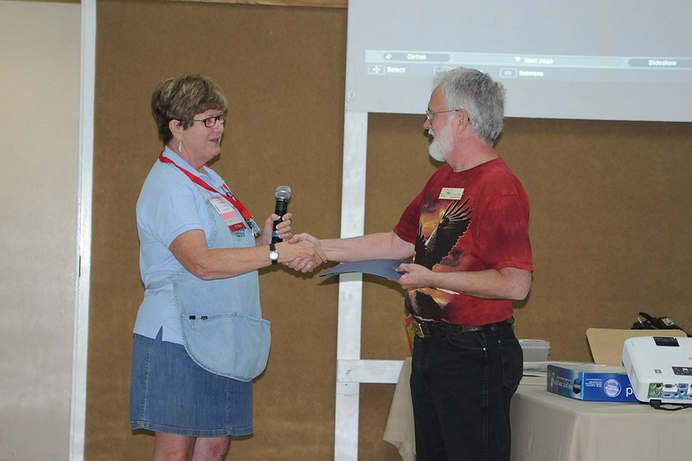 In a PowerPoint presentation, Pauline Tom showed how Keith Kridler is, indeed, a "cornerstone" of Texas Bluebirding and of theTexas Bluebird Society. Keith was co-founder of Texas Bluebird Society and the first Vice-President. The birth of Texas Bluebird Society coincided with the release of the book he co-authored, "The Bluebird Monitor's Guide". A "primer" he wrote that is now known as "Everything You Ever Wanted to Know About Bluebirds …. but didn't know to ask" was mailed to all North American Bluebird Society members in Texas and brought in dozens of memberships for TBS. The respect people have for Keith as the most renowned Texas bluebirder transferred over to respect for the fledgling organization. 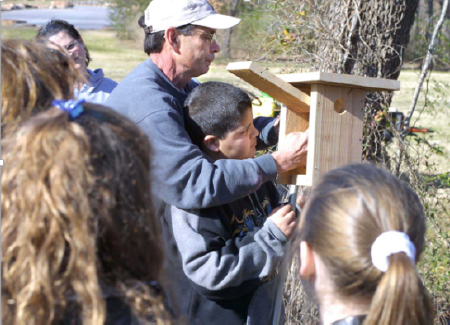 As a pioneer in Texas Bluebird Society, Keith forged the way as a mentor by building and providing hundreds of nestboxes (made from scrap pine logs) each year, speaking to dozens of groups in the first two years of TBS, and helping others start bluebird trails. This is the same work he had done on his own for years. 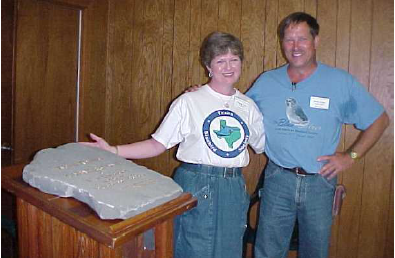 The large, heavy carved stone "Cornerstone Award" with gold lettering was symbolic of the critical role Keith Kridler provided in the start-up of Texas Bluebird Society as the organization started on the mission "Bluebirds Across Texas … one nestbox at a time." Congratulations to Kenny Munoz and Lisa Munoz, recipients of the 2017 Good Egg Award. Kenny joined TBS when he was 11 years old. Since then he and his mother, Lisa, have worked tirelessly before, during and after each of our annual events. In fact, Lisa was so busy at this event that she could not even stop to receive her award and have her picture taken. Thank you, Lisa and Kenny. What a difference you make to our success! TBS created this unique award to honor Clyde Camp, who jumped in and saved the TBS website. The week our web-master gave up his volunteer position this year, Clyde introduced himself to Pauline Tom at a TBS booth and asked, "Who is your webmaster?" What a godsend! Within hours he provided a resume, a sample of what he could do with our website, and a very reasonable quote for his web development services. The Board quickly accepted his proposal. Clyde quickly joined TBS, and was one of the first to register for the Symposium. His enthusiastic efforts, long hours, willingness to jump in on short notice, sense of humor, and professionalism earned him this award.